Sunday was Veterans Day, which is observed on November 11 because it was on November 11, 1918, at 11 am, that the World War I armistice between Germany and the Allied nations came into effect. (The peace treaties that officially resolved the conflict were not signed until 1919, including, most famously, the Treaty of Versailles.) The commemoration called Armistice Day was held for the first time on November 11, 1919, to honor veterans and the millions of soldiers who died. Congress later changed the name from “Armistice” to “Veterans” to include the veterans of later wars, and November 11 became a day to recognize all American veterans, where ever and whenever they had served. To mark the centennial of the end of “the war to end all wars” (a phrase that comes from H. G. Wells’ book The War That Will End War), and in conjunction with the exhibition “The book is not about heroes”: Poetry and World War I, the library hosted an exhibition talk with curator Lucy Eills, Class of 2018, and a multi-colored “remembrance poppy” study break. From the beginning of the conflict on July 28, 1914 through the armistice of 1918, the front line of battle often ran through the Belgian provinces of West and East Flanders and the area known as French Flanders in northern France–hence, McCrae’s term “Flanders fields.” McCrae wrote the poem after a friend killed by artillery fire was buried in a makeshift grave, one among many in a battlefield blooming with wild poppies. The common red poppy, Papaver rhoeas, is an annual flower whose seeds can lie dormant a long time and germinate when the soil is disturbed. These flowers grew in great numbers in the unsettled earth of the battlefields and cemeteries of Flanders. 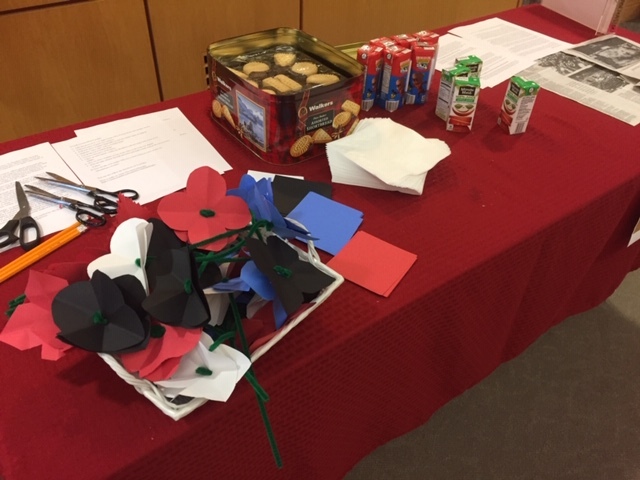 In response to McCrae’s poem, Moina Michael, a teacher from Georgia, wrote a poem called “We Shall Keep the Faith,” and launched the red “remembrance poppy” movement. Over the years, “remembrance poppy” symbolism has expanded. 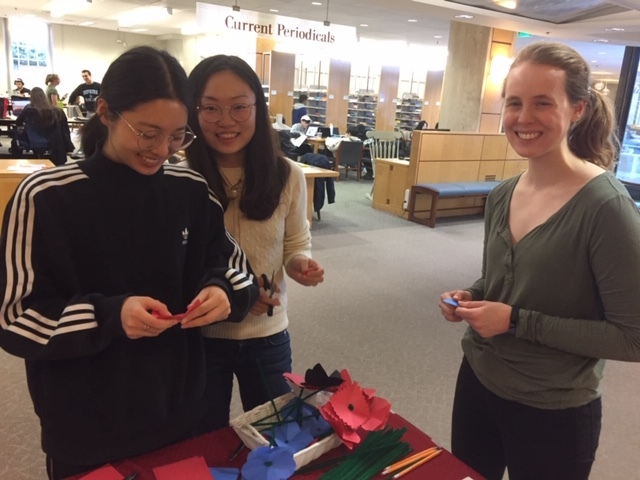 While the red poppy was originally worn as a memorial to Allied military personnel who died in World War I, the meaning has grown to encompass military personnel who died in later conflicts. Purple poppies commemorate animals who were injured or died in war. Millions of horses, dogs, and pigeons were put to work in the First World War and often lost their lives. The purple poppy campaign was launched in 2006 by the animal rights organization Animal Aid. More recently, purple paw pins and blue poppies have come into use to indicate that animals, unlike humans, do not have the power to make a conscious choice about war participation: they are victims, not war heroes. Black poppies have two meanings. In 2010, the organization BlackPoppyRose was founded to honor the African, West Indian, Pacific Islander, and Black soldiers, porters, and laborers who served and died in World War I. Families and communities were displaced during the war, and colonial resources were crucial to the war effort. To a large extent, World War I was fought over these colonial resources. But these issues are frequently neglected in traditional commemorations of World War I and later conflicts. Black poppies have also been adopted as an anti-war symbol by the Stop the War Coalition since 2014, in memory of conscientious objectors. The ways we choose to memorialize war, as individuals, communities, and nations, are deeply personal and political. A war-related ceremony or monument can offer a space for contemplation or serve as a violent flashpoint. Even remembrance poppies can be controversial. Because of a poem, the bright, simple, common poppy has become, paradoxically, a sign of war.